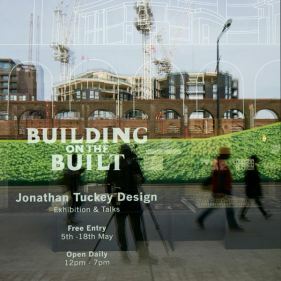 In the Spring of 2016 we exhibited a retrospective of the studio’s work within a vacant retail space in King’s Cross loaned to us by Argent, our clients for the nearby Gasholders residential development. The exhibition presented an array of models at various scales and states of resolution, alongside drawings and photographs, produced over the past decade by the practice. Fragments of individual interventions sat alongside larger ensembles of projects shown within their wider context. The exhibition featured a 13 metre long, tiered display plinth constructed from over 100m2 of Valchromat sheet and featuring integrated LED lighting and moving image projectors. In parallel to the retrospective, the exhibition space hosted a series of talks and lectures on the theme of ‘Building on the Built’ which included breakfast talks hosted by Eddie Heathcote, Chris Foges and Kieran Long. The facilities for the exhibition were lent to us by kind sponsors and the display plinth was recycled by the workshop of the Royal College of Art.